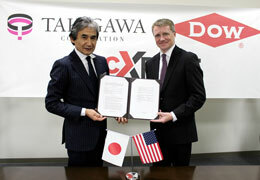 Dow Packaging and Specialty Plastics, a business unit of Dow Chemical, has secured its second PacXpert packaging technology collaboration in Japan with Takigawa Corporation. This license agreement comes a year after the first partnership with Kyodo Printing in November 2014, and will allow Takigawa Corporation to produce the packaging for a wide range of applications to their customer base across Asia Pacific through its manufacturing sites in Japan and Vietnam. This marks the 11th licensee agreement for PacXpert packaging technology globally, and the third in Asia Pacific. Takigawa is a flexible packaging converter in Japan, and provides high-end packaging for a wide range of applications for both liquid and granule content for food and non-food related products. With the agreement, Takigawa will advance the reach of the award-winning PacXpert packaging technology across Asia Pacific to their distribution markets in Australia, Indonesia, Japan, Thailand and Vietnam. “PacXpert packaging technology is an innovative packaging solution which has multiple qualities, such as sustainability benefits and solving the unmet needs of end-users with easy-handling properties. By partnering with Dow, it allows us to develop our products together and exploit our synergy for greater business expansion with both our global footprint. This collaboration keeps our focus on new packaging solutions with high value propositions,” commented Hiroyuki Takigawa, president of Takigawa Corporation. PacXpert Flexible Packaging Technology is a lightweight packaging design offering a fitment closure and integrated ergonomic dual handles, enabling precision pouring with no glugging, easy reclosing and convenient carrying. While flexible, PacXpert is shelf stable and can stand upright or on its side once filled, and facilitates the conversion of large hard plastics containers to portable packages. It also provides multiple environmental benefits by minimizing content waste, reducing raw materials and offering a higher product-to-package ratio. The PacXpert technology shows enormous potential for household, institutional, food service and industrial applications.